Stocked from 1/2″ OD – 4″ OD. Equal lengths from the centre, to each end face & branch. Available in a dull polished & descaled finish. Test certification can be supplied on request. Stocked from 1″ OD – 4″ OD. Same overall length as an equal tee, but branch is pulled. 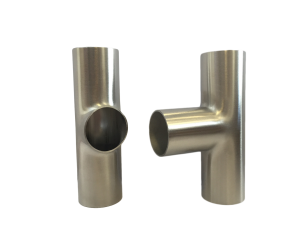 Made in house by Berkeley Stainless Fittings Ltd. Please note: Not all sizes, grades, and finishes necessarily available from stock. Size: 0.5" 0.75" 1" 1.25" 1.5" 2" 2.5" 3" 4"